Checking back I find that my grandfather John was born at 15 Leith Street in March 1870. His father was called Felix and was a cobbler in the Canongate. He met a strange unexplained end. He was found at the foot of Salisbury Crags. They did not know if he jumped, was pushed or blown over by the wind as quite often happens. 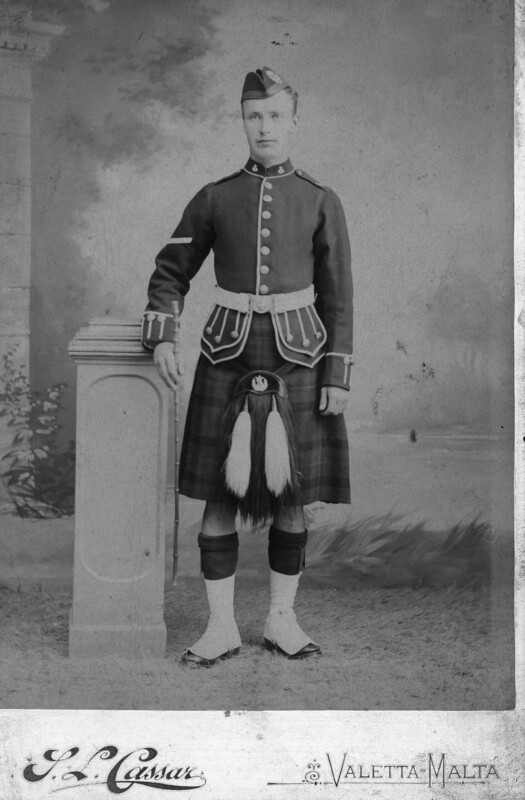 Grandad was a sergeant in the Queens Own Cameron Highlanders but sadly died at quite a relatively early age after leaving the army to be able to be with his wife and six children. He served in South Africa and India where Granny and the two youngest children were with him. 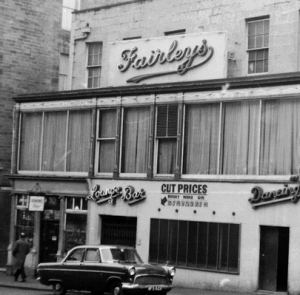 Probably in the 1920′s my Granny was a cook at Fairleys. She left after Mrs Fairley refused her a rise in wages and told her to do what he other girls did band sell her body. I remember one story he told me of a lady who was entertaining a gentleman when her husband came unexpectedly home on leave. He evidently threw the guy out of the window and he was found unconscious of the ground in the morning. My father John was the postman for Leith Street and Greenside and could probably have given you much information on the area. 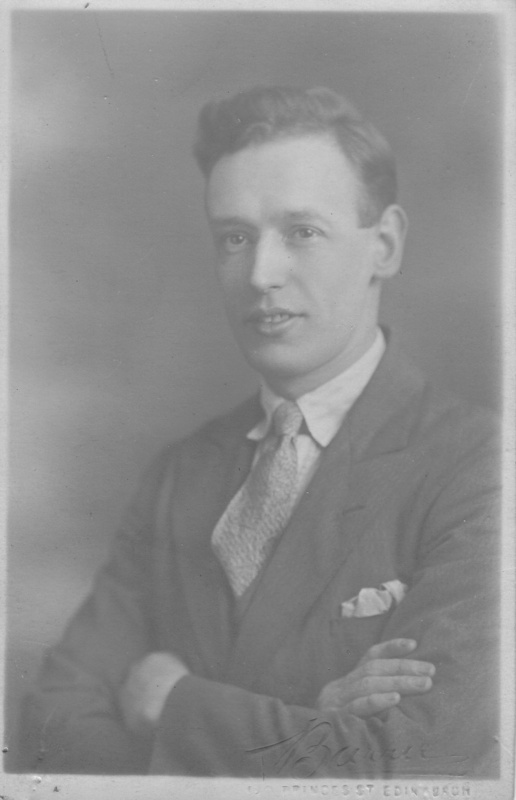 He was on that Walk from the 1930′s probably until the early 50′s when because of the onset of Parkinson’s Disease caused him to have to become a sorter in the GPO. It must have been one of the toughest walks in Edinburgh with the Greenside temements to cope with. He got that Walk by choice. We lived in Annandale street so at the end of his first delivery he was home for breakfast. After the second delivery he was home for lunch and early home after the third delivery. For a while my wife worked in Simpsons tobacconists opposite the Imperial. When the American fleet was in she used to come home amazed at how often some ladies would go into the hotel with a sailor on their arm. I remember one story he told me of a lady who was entertaining a gentleman when her husband came unexpectedly home on leave. He evidently threw the guy out of the window and he was found unconscious of the ground in the morning. My first job on leaving school was with a wholesale and retail tobacconist in the high Street and I knew Thomson and Porteous very well. I was given a tour of the factory and very often went there to collect tobacco, cigarettes and snuff. They did a big export trade. Over on Leith Street Terrace was another wholesale tobacco company that I used to collect from. Are you old enough to remember the old Leith Street? When it was disappearing we lived in Surrey so missed most of the demolition. Other Leith Street memories, Porters Toy shop at the top of the lane leading down to Greenside. Cochrane’s just up from the Salon, a big drapers shop with the old fashioned way of sending money the office and back. By the way the Salon was not just B movies it showed the Big Movies but quite a while after release. I remember seeing the Crosby/Hope Road Movies there and From Here to Eternity. Another shop next to the Playhouse was Norma Jean (or was it Anne) the ladies wear shop my mother went to. Millers Radio was where I first saw television when they demonstrated it. I watched the Kings funeral there as they put in seats for customers. There was also an amusement arcade that I frequented at a young age. We kids were not restricted by fearful parents in those days and from about six I wandered around Edinburgh quite safely apart from getting knocked down by a van in Gayfield Square and dislocated my hip. I can’t imagine actors going into the Theatre Royal as it was usually a season of changing weekly Scottish variety Revues, Pantomimes and Circuses. Jack Anthony, Dave Willis, Jack Radcliffe and Tommy Morgan who was appearing there when it burnt down in 1946. I slept at the back of our flat in Annandale Street and could see the huge fire in the distance. My mother would not take me out to see it from closer. I used to go to the Sunday school in St James Square just up from the theatre. The Sunday School was deliberately burnt down before its due demolition as part of a film or TV series at the time. I went to London Street school from 1939 till 1942 but I only remember one boy in my class being from Greenside, Peter McGee. Another memory was the little old lady wrapped in a shawl who played scratchy old records on a wind up gramophone outside the Playhouse. Leith Street holds many memories for me and it was always my most favourite Edinburgh street, always lively and interesting. I bought my bike in Halfords when I was 13 and my first suit from one of the Leith Street tailors. I always preferred Jacksons. They disappeared when Leith street was redeveloped . In 1956 I brought my wife to be up from London for the Easter 1956 weekend to meet my family and we bought our engagement ring in H.Spencer. We later bought our wedding ring from a Spencer’s in Holloway. 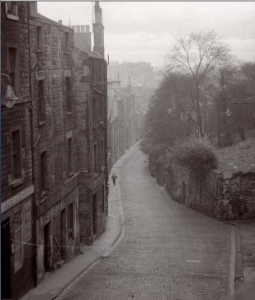 I used to travel up and down Leith Street four times a day as I worked in the High Street from 1950 to 1953 before moving to London. 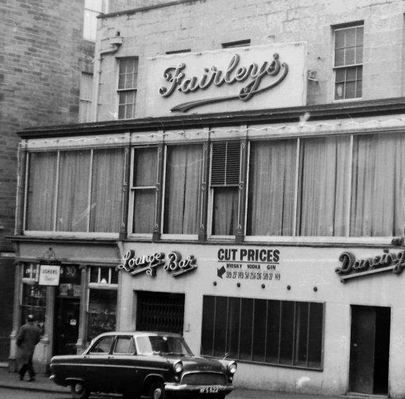 I mentioned the amusement arcade I Leith Street, it had a Tattoo Parlour that was very popular with servicemen from all countries. At the end of the American TV series Band Of Brothers the ex soldiers it is based on tell of their wartime memories. One tells how he took the train from London to Edinburgh for a day just to be tattooed. I’m not sure if he said that his tattoo was done in Edinburgh or if it was in Leith. 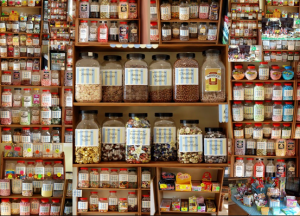 Duncan’s sweet shop brought all my aunts from each side of the family out on a Saturday afternoon. They brought the ration books of family and friends and lists of what they all wanted. If you took a pound of sugar to Duncan’s they let you have a pound of sweets without points. 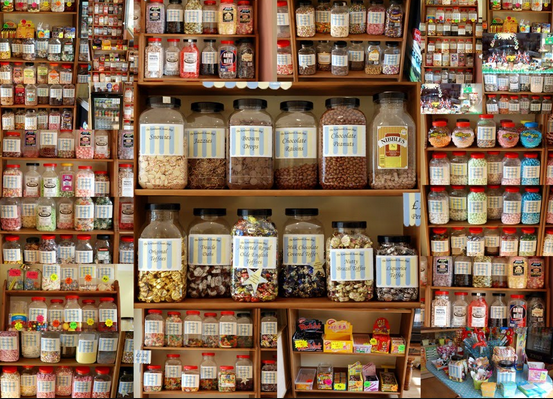 We often swapped sweets to let ourselves have a variety. There was always a big queue at the shop on Saturdays. I don’t remember the second shop mentioned. The Scots, it has been worked out, eat more sweets than any other people in the world, the Swiss coming a not too close second. The simple explanation of this not altogether enviable reputation is that since 1680, when sugar began to be shipped in bulk from the West Indies, sugar refining has been an important west of Scotland Industry – Greenock on the Clyde being known as “Sugarapolis”. Sometime in the late 90’s I followed up a story in the Sunday Post by writing of the terrible night when mobs broke the windows of Italian and German shops. An Edinburgh ‘Italian’ contacted me after that for any other wartime memories as he intended to write a book about Italians in Scotland during the war. We corresponded by E-Mail for some time. His name was Joe or Joseph but his last name escapes me. I don’t think that he still lived in Edinburgh and think that he had originally lived in the Elm Row area.. We had in common that we had both lost a child. He had started or was associated with a group that helped bereaved parents. I often wondered if he had finished his book. Mention of him and his group popped up years later on a NG. I found his organisation again but his name was no longer on it. You or someone out there might know of him if the book was published. Do you have an Italian background? Over in Elm Row we had Crolla’s café, Gasparini fish and chips and others. My mother was friendly with Mrs Pompa who had an ice cream shop café in Brunswick Street… now the excellent Vittoria Restaurant. In the pre war days I could get a halfpenny cone there. I remember when Italy came into the war and a mob went down Leith Walk smashing all the windows of Italian shops. The Gasparini’s lived at 13 Annandale Street. By remarkable coincidence their son Peter moved into the flat above the one we lived in at Pilrig Street from 1994 to 2006. His sister was the mother of Mrs Di Rollo who sells the Britain’s best ice cream in Musselburgh. 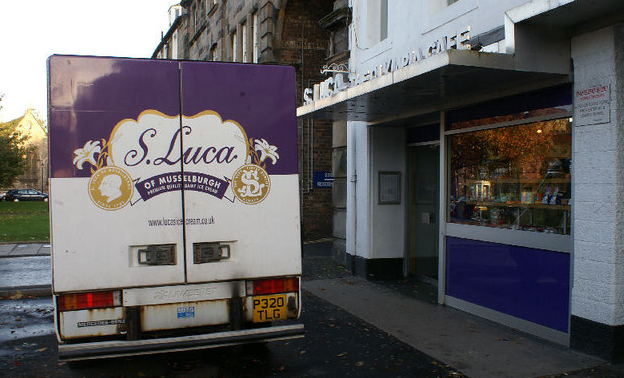 S. Luca of Musseburgh Ltd. is a family run business and we have been manufacturing ice cream since 1908. We are based in the seaside town of Musselburgh. “The Honest Toun”, on the outskirts of Edinburgh. It all began in the late 1800s when Mr Luca Scappaticcio and his wife Anastasia arrived from Casino, in Italy. Luca was employed as a barber and then went on to become a pastry chef in the now Balmoral Hotel. The latter job was to prove invaluable as it was here that he learnt how to make ice cream having been taught by a Swiss Sous chef. By 1908, Luca had saved enough money to rent a shop in Musselburgh which he and his wife ran. They decided to drop the name Scappaticcio in favour of Luca for simplicity, as it was much easier to pronounce. Initially, it was very hard work especially as they both had to walk back to their home in Edinburgh’s Grassmarket every night. When they had acquired more money they were able to secure some of the surrounding property. Ice cream manufacturing in those days did not require expensive equipment but did mean hard work and long hours. The milk, sugar and butter mixture was boiled, simmered and continuously stirred until it reached custard-like consistency. Containers with dry ice were used to keep the ice cream cold – of course, at that time, no electric freezers were available. As a result of this hard work and dedication, our ice cream and name became well known and highly regarded in and around East Lothian. Also a small fleet of vans had been acquired which sold (and still sell) ice cream in various East Lothian villages. During the early 1940s, WW2 was having an impact and we were fortunate to have survived this as all the men in the family joined the British Army and were away for up to five years. Ironically, Luca himself was perceived as an enemy alien and sent to the Isle of Man for five years. His daughters were left to run the shop at this time as Anastasia and her youngest son were interned and sent to live in Peebles. Despite the hardship of the war years, we opened a shop in the Craigmillar area of Edinburgh in 1941, run by one of Luca’s daughters and her family. By the early 1950s, we had also acquired a café in the scenic seaside town of North Berwick where our ice cream became very popular with holiday makers. Our ice cream vans are still a familiar sight throughout the year in North Berwick. Our business has always been very family orientated. Today there is one member of the second generation left, Constanza Luca, who is 84 years old and still somewhat active in the business. Several of the third generation are taking the firm into the 21st century. Oh my! the memories! My grannie lived in Haddington Place, where we spent a lot of time. The Salon, the Playhouse! Was friendly with Tony and Jackie Pompa, who’s Mum had the ice cream shop and the d’Agostinos who had a restaurant in Leith Street. And later I lived in Musselburgh with regular visits to deLucas. A long time ago, but the memories are as fresh as ever. I now live in Norfolk Island, a wee dot in the Pacific Ocean. What a coincidence. I came upon the picture by chance and thought it was MY grandfather who was called John Fitzpatrick and was also a postman although from Glasgow. 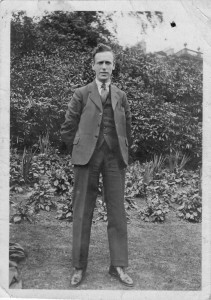 He was in the Argyle and Sutherland Highlanders and wounded at the Battle of the Somme and we have a similar picture of him. I don´t have any direct link with Italians in Scotland but my wife is Brazilian and of part Italian descent. Somebody once said the Italians added a “seasoning” to life in Scotland and I go along with that.Thanks for a nice read. I later found that the Felix Fitzpatrick found at the foot of Salisbury Crags was my the son of my Great Grandfather so would have been my Great Uncle. He had been a Street Porter and had jumped as he had cancer. I now have a copy of his death certificate and the revised Procurator Fiscals report that says. “felo de e” Fell on himself in other words jumped. At one time suicides were not entitled to a religious funeral and were buried at a crossroads after midnight with a stake through their heart and their possessions were forfeited. Thank you John I really enjoyed reading your memories certainly brought back lots of lovely feelings. My family moved to Greenside Row about 1948 and I left about 1962-63 and I went to London Street School and then on to Bellevue. My maid name was Smith and I would dearly love to find out the history of Greenside Row. I seem to remember reading that in the 1800s Greenside Row was some sort of infectious hospital but not sure. I guess Greenside was classed as ‘slums’ but living there I was never conscious of it.